MOWGLI is a curiosity piece, a non-Walt Disney’s THE JUNGLE BOOK. 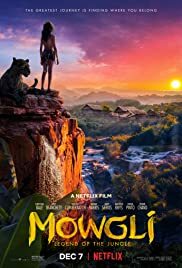 Made by Warner Bros and and slotted for release in 2016 the same time as Disney’s live action THE JUNGLE BOOK, with both films based on the Rudyard Kipling stories, MOWGLI was delayed two years and in the meantime got bought over by Netflix. After an initial November release in the theatres, MOWGLI can presently be seen on Netflix. Needless to day, watching it on the big screen in 3-D is optimal, as expressed by director Serkis himself. MOWGLI is a quality film like many of he new Netflix originals these days, the most notable being ROMA which is also playing and likely to be nominated for Best Foreign Film. The story runs along the same lines as the animated Disney’s 60’s full length cartoon and its 2016 live action version. MOWGLI begins with the appearance in the jungle of Kaa (Cate Blancette), an Indian python seer, watches as Shere Khan (Benedict Cumberbatch), a crippled Bengal tiger, breaks jungle law by hunting down a family of humans, with only the child escaping. 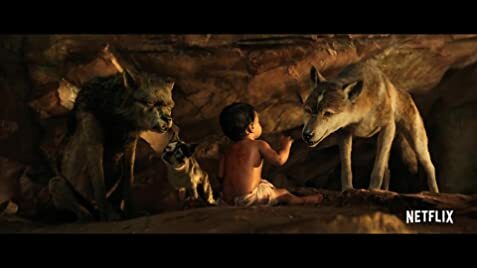 Bagheera (Christian Bale), drawn to the scene, rescues the man-cub, Mowgli (Rowan Chand), and takes him to a family of wolves being raised by Nisha (Naomi Harris) and Vihaan (Eddie Marsan), only for Tabaqui (Tom Haollander), Shere Khan’s hyena follower, to find the boy before he is chased off. They take the infant Mowgli before the wolf council and Akela (Peter Mullan), the pack leader, to decide his fate, with Bagheera buying his life with a kill and Baloo strong-armed into agreeing. Shere Khan arrives to kill Mowgli, but Akela stops him, saying the boy is now a member of the pack and forces Shere Khan to leave, but not before the tiger vows to return. The story goes on with Mowgli discovering his own kind (the man village). The climax is the fight between MOWGLI and There Khan. Kaa intervenes to save Mowgl near the end. Serkis’ versions the most serious of all the JUNGLE BOOK film, undoubtedly. There are scenes where carcasses are eaten. The animals like the slimy python, Kaa look incredibly real and therefore scary – perhaps too scary for children under the age of 10. A few sentimental hogwash segments like Nisha telling Mowgli that he belongs, no matter what others say, could have been dispensed with. The film is also too playful for adults. One wonders the target audience of the filmmakers. The time gap between Disney’s THE JUNGLE BOOK and MOWGLI helps. For one, many would have forgotten the main story- and if not at least a few key plot points. Netlflix buying the film from Warner Bros. is likely a good thing as this gives the film a different distribution, be in cables subscribers. The chance of losing money on this one is less as well. The cost of production is not listed but it must be up there in the millions, as the film’s special effects are exceptional.